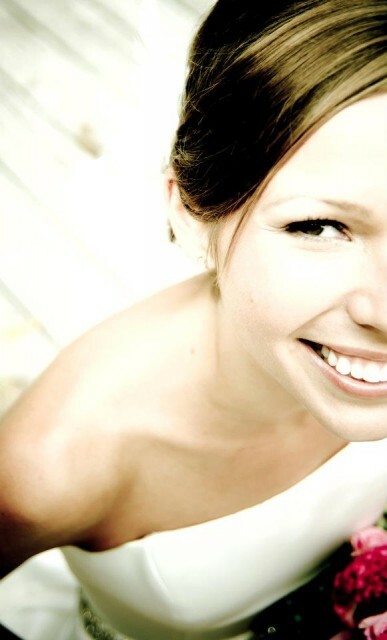 A Brighter Smile :: Should You Whiten Your Teeth for Your Wedding? You greet everyone you meet with a smile on your wedding day, why would you not want your smile to be as white and shiny as possible? This typically takes longer (3 – 4 weeks) and you might not get the shocking white results you are looking for. While toothpaste can remove stains, it won’t change the color of your teeth and tends to be more abrasive causing your gums and teeth to become extra sensitive. Also, your diet will play a big role in this method, we suggest avoiding foods that will stain your teeth in your pre wedding diet. Whitening strips are a more intensive treatment than toothpaste, but work quicker (1 – 2 weeks). The results can last up to 2 – 3 years if you are properly caring for your teeth. I suggest trying these out a few months before the wedding to make sure they give you the results you are looking for. If you go through the effort to whiten your teeth don’t ruin it days before the wedding by drinking coffee and tea that will stain your teeth and lessen the effect of your treatment. Yes ladies, this means red wine too – limit yourselves in the days leading up to your wedding day to keep your pearly whites clean. If you’ve never gotten your teeth whitened before, beware of having your wedding day be your first. Your teeth come become extremely sensitive from the treatments, and can cause a lot of pain for your big day. They say beauty is pain, but is this the type of pain you want to be dealing with on your wedding day? If you want to throw caution to the wind and get your teeth whitened anyways, despite having never done it before, give yourself a week or two to recover. Quick Poll… Did you whiten your teeth before your big day?